It’s goal setting season and everyone is reviewing the organization’s FY15 goals. Understanding the organizational goals is important because we all want to be sure to be in line with the direction of the organization. People use this word constantly. There’s even groups in my organization that are called the “enterprise groups”. I was told recently that there’s “less dysfunction in the enterprise groups”. To which I had to ask “which groups are those?” (Answer: They’re the ones that have significant business value.) But the fact that I can’t find someone to give me a coherent definition is a warning sign that it has become a meaningless buzz word. But business is the right answer. Enterprise seems to be anything that encompases the entire organization (or a significant portion of it) or something that has significant business value. Anyway, that’s neither here nor there. What I think someone was trying to say with “enterprise IT architecture” is a standardization of technology across the organization — often a pipe dream. And I think this goal tends to draw extra attention to the groups that are already considered the “enterprise” groups. But I’m begging a deeper question here. Shouldn’t everyone be considered enterprise? 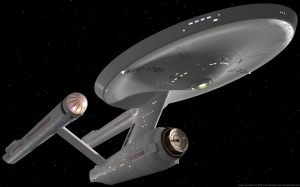 If enterprise is just a fancy word for business. If you’re not providing significant business value to your organization, then maybe you need to rethink what it is you’re doing. If you’re not considered enterprise, then someone doesn’t think you’re providing business value, effecting enough people or having enough impact. So when “establishing an enterprise IT architecture”, I’m taking that to mean communicate with other groups, figure out what they’re doing and share what you’re doing. Meeting that goal is potentially impossible with a large silo’d organization. But working toward that goal is ambitious and requires a lot of time. Working towards that goal is just implementing good collaborative practices. Simple but not easy. Posted in Uncategorized. Tags: architecture, buzz words, enterprise, goals. RSS feed for comments on this post.. TrackBack URL.